displaying time with the utmost efficiency. The BR03-92 Nightlum fits perfectly into the family of instrument watches with the objective of optimum readability. Its box, designed in a contemporary style, retakes the “circle in a square” —the iconic shape of the house— that recalls the silhouette of a plane cockpit clock. The BR03-92 Nightlum returns to basics with its pure and simple lines. The display is also simple and uncluttered and the graphic dial boasts clear indications. This name of this model evokes light, “Lum”, and “Night” for its outstanding readability at nighttime in its matte black case. With its unparalleled brightness, the green tinted Superluminova® C3 is ultra-phosphorescent and has a very long durability in the dark,offering a continual reading of the hour even in complete darkness. The Superluminova® C3 treatment also allows for an easier reading of indexes and large numbers, be it day or nighttime. This intense green light offers an excellent luminescence that contrasts with the matte black dial and provides optimal night readability. 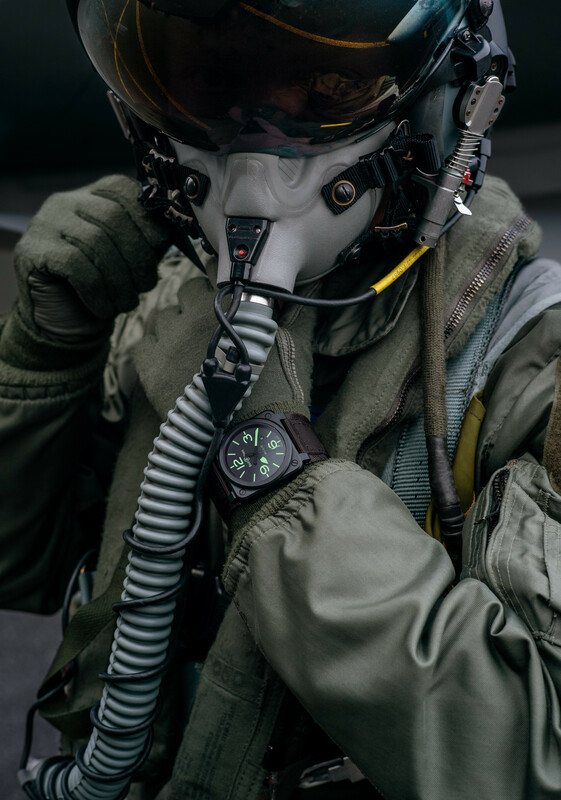 The shape and position of the four numbers on the dial: 12, 3, 6, and 9 are reminiscent of the graphics traditionally used by Bell & Ross.The minimalist design of the BR03-92, with its black matte ceramic case, ultra- phosphorescent green numbers and grey-green calfskin strap will seduce every pilot watch lover.